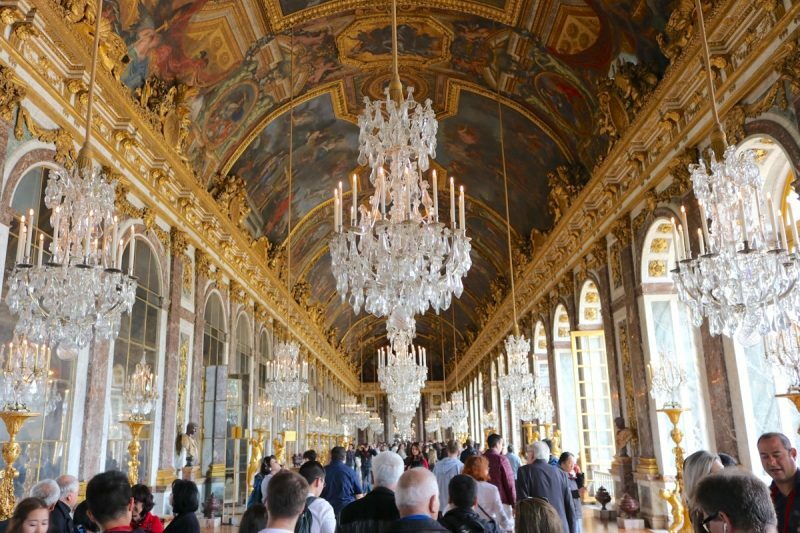 The region of Paris is full of cultural activities to do; among the most amazing, the visit of the Palace of Versailles is unavoidable. This UNESCO World Heritage Site is famous for both its palace, its gardens and its unique fountains show. An excitement for any luxury lover! 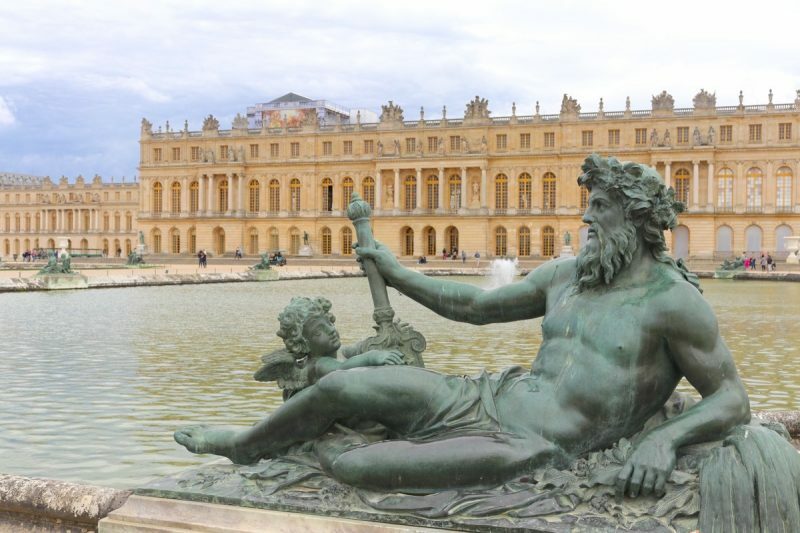 Located just 20min away by car from Paris, Versailles city is a destination in itself. Beautiful bourgeois streets, a large food market with traditional local products and of course, the Palace of Versailles. With a couple a friends we decided to pay a visit there during a weekend and we spent a full day visiting the Palace in the morning, lunching at Ore fine-dining restaurant by Alain Ducasse and walking through the extensive gardens in the afternoon. A perfect day. 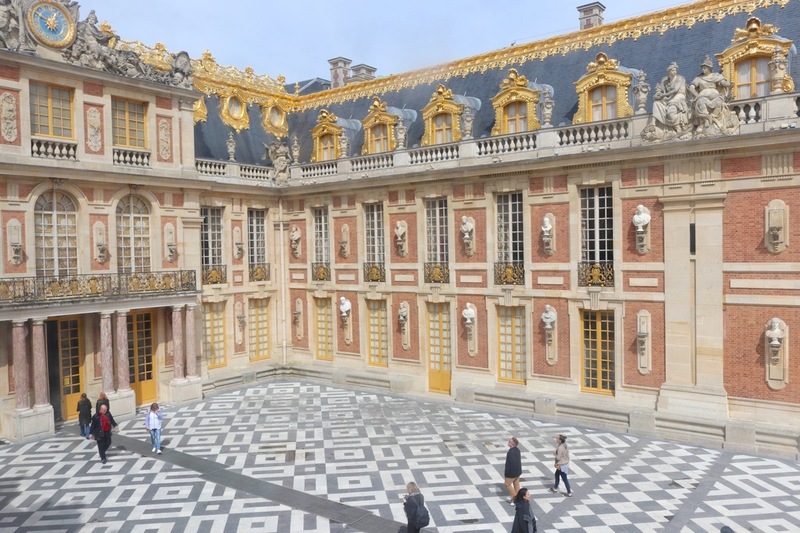 We started our day by visiting the main building of the Palace of Versailles, hosting Mistresses’ Apartments. And thanks to our “dual” tickets booked online at Ore restaurant, we had the great chance to bypass the long outside queue and we arrived directly to the security check-point. We probably saved an hour of waiting! Architecture fans, and even uninitiated people, will immediately fall in love in front of building’s entrance. 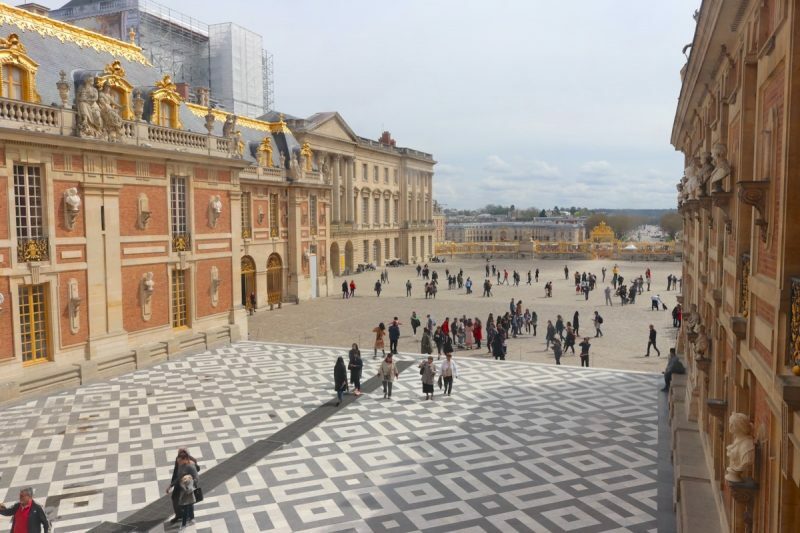 This emblem of French 17th century art reveals amazing walls gilded with fine gold with large windows, and the stunning Marble Court paved with black and white marble in a geometric pattern. Two words came to me: Grandeur and Opulence. From the inside on ground floor, the visit consisted in moving from one mistress room to another, imagining the real life at that time. Of course, all objects, furnitures and paintings are original; they are all part of French history. Apotheosis of the journey was obviously the first floor and the discovery of the Hall of Mirrors. The quintessence of French luxury and classical art, the masterpiece of masterpieces, I don’t have words strong enough to describe how I felt by passing through it for the first time… Designed by Jules Hardouin-Mansart in 1678 under King Louis XIV supervision, this “room” pays tribute to the political, economic and artistic success of France over 73 meters. Outstanding! 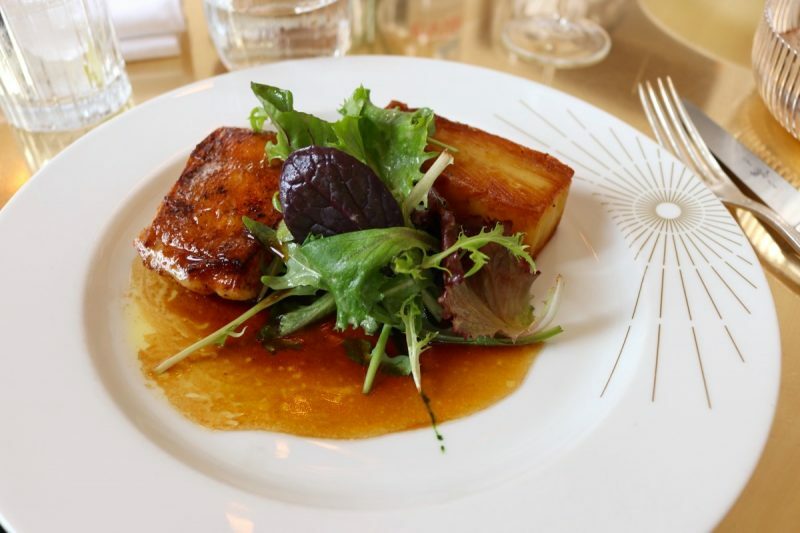 After our visit of the Palace of Versailles’ main building, we went to Ore restaurant – owned by Alain Ducasse – for a delightful lunch. 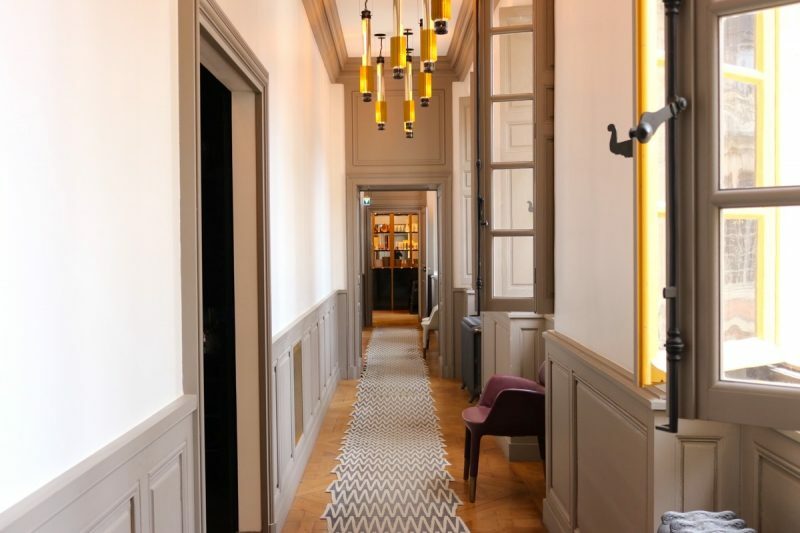 The place is located right in a side wing of the Palace of Versailles, with a modern-epurate interior design and gorgeous views over the Marble Court. This interior design makes a beautiful contrast from the rest of that prestigious location and I have to say it’s perfectly integrated; a magical scenery for customers and a true fine dining moment. I particularly enjoyed the bar side and its luxury liquor’s bottles, managed by a charismatic bar tender. The package tickets we booked offered starter + main dish or main dish + dessert (that’s the option we selected), with a glass of wine or a soft drink, from a daily refreshed menu. I chose the braised chicken and its purée that was an ode to French gastronomy: beautifully dressed in the plate, tasty, a great main dish! 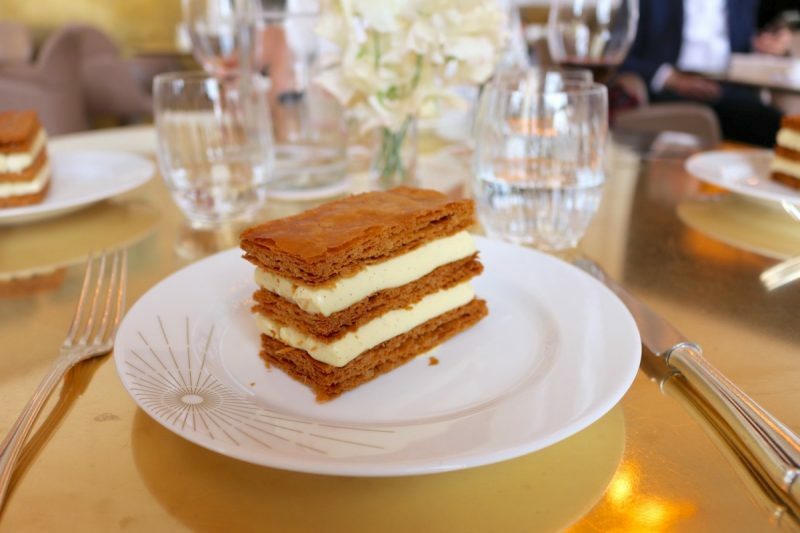 For dessert, I picked out the Millefeuille with Bourbon vanilla cream. So delicious! The best conclusion for our lunch, ready to start the last part of our tour at Palace of Versailles: the visit of royal gardens. Gardens of Versailles was considered as important as the Palace for King Louis XIV, they have been created and renovated by the famous royal gardener André Le Nôtre. The best moment to discover royal gardens is the afternoon from 3pm with the beginning of the Fountain Musical Show, until 5.30pm. We walked through the main parts of the garden, visible from the Palace, while the entire park spreads over more than 800 hectares. 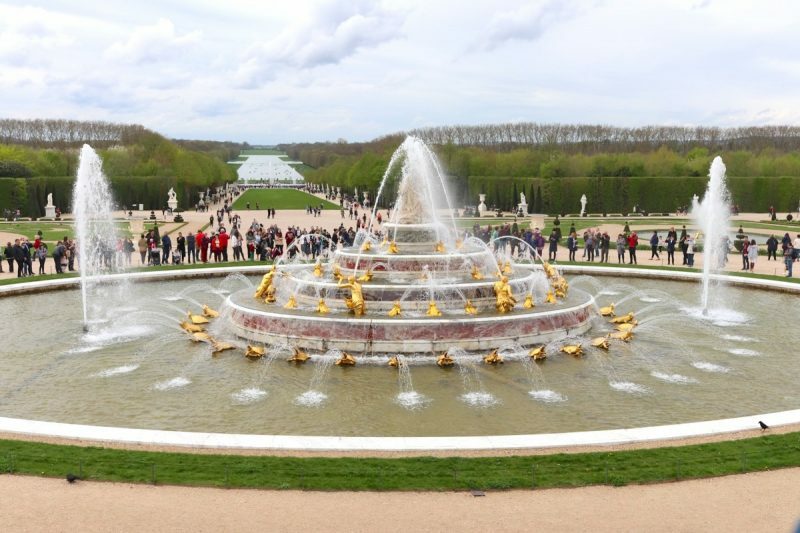 Climax of that outdoor walk is the tour of fountains, especially the ones located in the east-west perspective right in the axis of the Palace. On the other hand, plenty of smaller fountains are hidden in the side groves, as well as statues and vases. I really liked the Ballroom and Colonnade groves, I was pretty impressive to see so magnificent places in such unexpected areas. 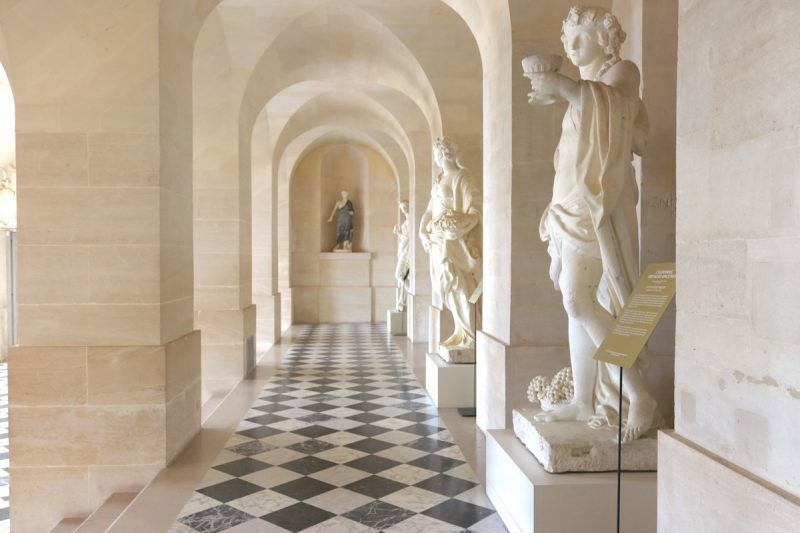 The Palace of Versailles is a fantastic place to discover French classicism, architecture and amazing art pieces. You can easily spend a full day there, extendable to two if you wish to admire the Night Fountains Show and stay at the nearby Trianon Palace luxury hotel, for instance. Visited on April 15th, 2018.